There are 10 Memory Care Facilities in the Buffalo area, with 1 in Buffalo and 9 nearby. The average cost of memory care in Buffalo is $3,400 per month. This is lower than the national median of $4,650. To help you with your search, browse the 24 reviews below for memory care facilities in Buffalo. Better rated regions include Williamsville with an average rating of 4.8 out of 5 stars. Caring.com has helped thousands of families find high-quality senior care. To speak with one of our Family Advisors about memory care options and costs in Buffalo, call (855) 863-8283. Over 55,000 residents of Western New York have dementia. This number includes some of the 31,000 seniors living in Buffalo. To serve local seniors with Alzheimer'disease or other dementia diseases, there is one memory care facility within the city limits with several more in nearby Cheektowago and Williamsville. In NY, senior facilities designed for memory care are called Special Needs Assisted Living Residences. Buffalo and the rest of New York take memory care very seriously with help from the EDGE project. This web-based program teaches care givers how to provide quality care to those with Alzheimer’s and dementia. Buffalo has a low cost of living when compared to the rest of the New York and the United States as a whole. Housing offers the greatest savings which can benefit families paying for memory care in the city since residences can keep rates lower. The highest costs in the city are groceries and utilities, but they are still below state and national averages. Crime in Buffalo is very high. The city has a violent crime rating of 94 with 100 as the highest crime level. Property crime is lower but still pretty high at 64. Families of seniors living in memory care facilities may want to inquire about policies and procedures for keeping residents safe both in the facility and out on excursions. New York does not tax pensions or social security benefits. All money can go toward care and residence fees. Many seniors over 59 1/2 with taxable income can receive a pension exclusion up to $20,000. Buffalo is home to three medical facilities, including those specializing in brain health and dementia care, in the event of medical emergencies or illness. Those options are Mercy Hospital of Buffalo, Sisters of Charity Hospital and Erie County Medical Center. Memory Care costs in Buffalo start around $3,400 per month on average, while the nationwide average cost of memory care is $4,799 per month. It’s important to note that memory care rates in Buffalo and the surrounding suburbs can vary widely based on factors such as location, the level of care needed, apartment size and the types of amenities offered at each community. To see a list of free memory care resources in Buffalo, please visit our Assisted Living in New York page. 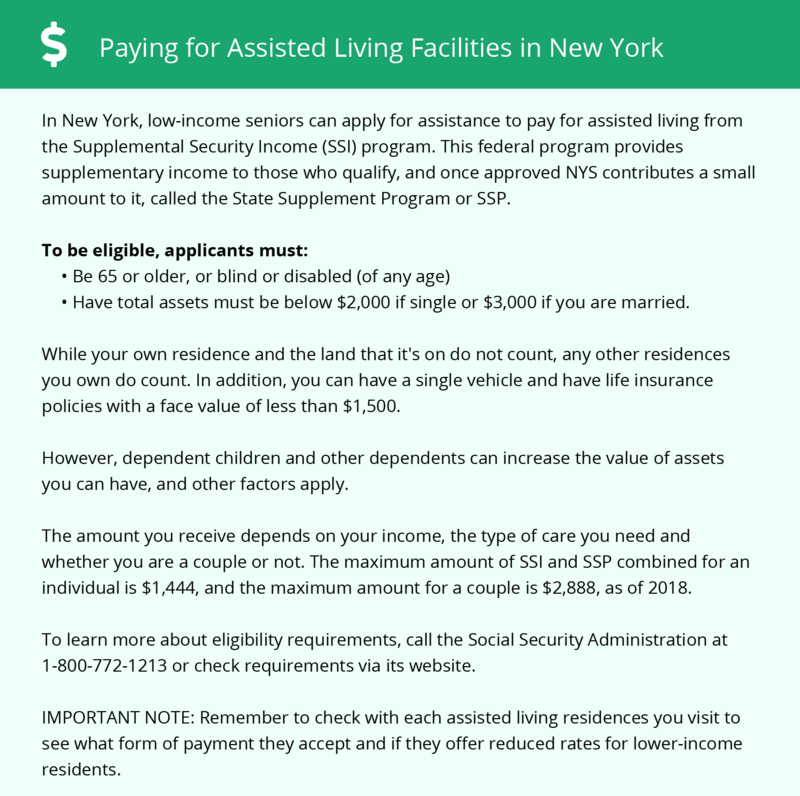 Buffalo-area assisted living communities must adhere to the comprehensive set of state laws and regulations that all assisted living communities in New York are required to follow. Visit our Memory Care in New York page for more information about these laws.